New Delhi: The rural jobs guarantee scheme, India’s flagship welfare programme, will allow for metalled roads being laid in villages, after criticism that the mud roads built till now deteriorate easily. The rural development ministry, which oversees the scheme, said in an 18 October circular that it has modified norms under the Mahatma Gandhi National Rural Employment Guarantee Act— which ensures 100 days of manual work to each rural household every year—to this effect. “There has been consistent demand from states that concrete roads are a basic amenity and should be permitted under the jobs guarantee scheme," a ministry official said, requesting anonymity. “However, it will apply only to internal (village) roads and the material component will come from other schemes." The rural roads scheme will mainly provide the materials for such construction under the jobs programme. Special priority in metalling roads will be given to villages that have a majority of economically backward people belonging to the scheduled castes or scheduled tribes, the ministry said in its circular. The ministry has kept the labour-to-materials ratio for the construction of concrete roads unchanged. 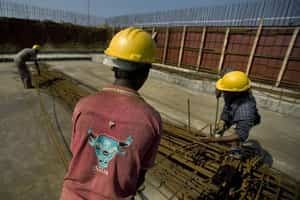 The job guarantee scheme specifies the expenses for labour and materials for a project under the rural job plan cannot exceed the mandatory 60:40 ratio. “It is a good idea but what is absolutely essential is to ensure transparency in procurement of the material component," said Yamini Aiyar, director, accountability initiative at New Delhi-based think tank Centre for Policy Research. “Most of the corruption under the scheme these days is not to do with muster rolls but largely with procurement of materials." The scheme has several in-built transparency mechanisms and the challenge will be to extend those to such a convergence between the rural jobs and roads programme as well, she added. Also, it will be important to make sure civil construction contractors are kept out of the metalling of internal village roads because the jobs scheme keeps them out of its purview, unlike the rural roads programme, Aiyar said. At least one member of 28.4 million rural households have been provided unskilled, manual work on projects so far this year, which include water and soil conservation, afforestation and land development works, under the jobs programme that aims to improve living standards in villages and curb migration to cities. The finance ministry has allocated ₹ 40,000 crore for the scheme in the year to 31 March.